When a young person moves away from family to live more on his or her own, onto a job and into an apartment or off to college, parents may miss having their older teenage child around. Soon, however, they start getting used to the freedom from responsibility that their son or daughter’s launch into independence brings. Now parents can start to relax, can focus more on themselves, and can live on less complicated terms. That’s when it frequently happens. Boomerang! Because of some adverse turn of events or life crisis, their departed child, dragging belongings and problems behind them, moves back home to stay for a while longer. This unexpected return can make for an awkward family reunion. Now the young person must submit to parental oversight and supervision from which they had been liberated, and now parents must witness a lifestyle that is less mature than the one that they wanted and is incompatible with their own. How common is this scenario? According to an article in the New York Times Sunday magazine (August 18, 2010), about 40% of young people in their 20s move back in with parents at least once. Wonder the parents: “What’s the matter with these young adults?” The matter is with this misconception: in most cases these are NOT young adults. They are in fact last stage adolescents, the stage I call “trial independence” in my book, BOOMERANG KIDS (Sourcebooks, 2011), and they still have significant growing up to do. In this book I describe the 10- to 12-year journey of adolescence that begins in late elementary or early middle school and doesn’t wind down until shortly after the college age years. Roughly, the four stages unfold like this. Early adolescence (ages 9-13) is focused on separating from childhood. Mid adolescence (ages 13-15) is focused on forming a family of friends. Late adolescence (ages 15-18) is focused on acting more grown up. And the last and hardest stage, Trial Independence (18-23), is focused on learning to live on one’s own. During this final stage, usually separated from home, the young person has to manage more freedom and take more responsibility than ever before, is surrounded by a cohort of peers who are also floundering from excessive choice, breaking all kinds of commitments, lacking a clear direction in life, suffering from insufficient self-discipline, and prey to a partying time of life where there is maximum alcohol and drug use. The question is: how are they supposed to spread their wings and keep their footing at the same time? Add to this one final complicating variable. The more the development of responsibility gets arrested in the first three stages of adolescence, the more challenging this final stage becomes, and I explain why. Finally, there are eleven life challenges that most young people must master during trial independence. 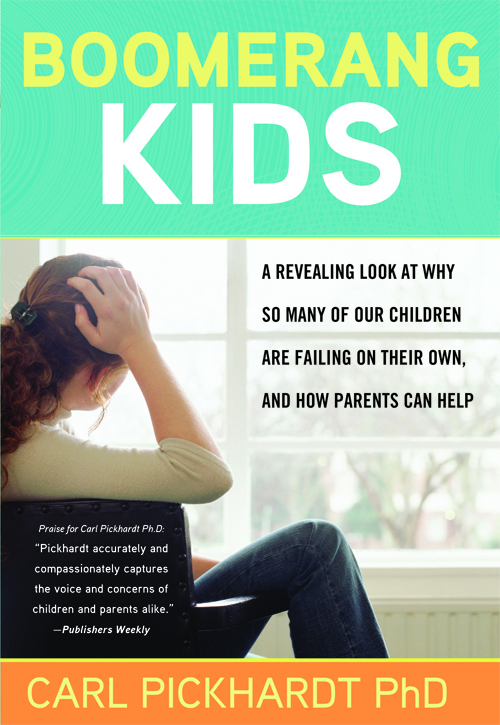 I take a separate chapter to describe how they can each come to crisis and send a last stage adolescent back home, and suggest how parents can be of help. These eleven challenges that I have seen in my counseling with young people at this beleaguered age are as follows. 1) There is the challenge of missing home and loneliness living apart from family. 2) There is the challenge of increased freedom from having a greater range of choice. 3) There is the challenge of further education and the risk of flunking out of college. 4) There is the challenge of unemployment and the hardship of seeking or losing a job. 5) There is the challenge of living in a domestic partnership with roommates. 6) There is the challenge of seeking, finding, and losing love. 7) There is the challenge of substance use and living in a drug-filled world. 8) There is the challenge of indebtedness from overspending and credit card living. 9) There is the challenge of stress and coping with excessive life demand. 10) There is the challenge of emotional duress and feeling overwhelmed by unhappy feelings. 11) There is the challenge of fearing the future and facing what to do with one’s life. Young people do not boomerang home without cause. When parents understand what the cause or causes are, they can help their son or daughter navigate the shoals of trial independence. They can help the last stage adolescent learn from experience, recover resolution, and get ready to try independence again. What a great sounding book. One I could have used years ago. If they haven't internalized the Gospel and learned to pray, many can get lost. On my TBR list!!! Thanks so much for bringing this concept to my attention. That explains a lot about why my 23 year old son just doesn't seem as mature as I thought he'd be at this age, even though he just got accepted into grad school!